September 23, 2018. Big Day - Mike has taken down the For Sale ad and has restarted Passage's restoration! Here is his email and work photos. Thanks for all the great stories and updates on Marionette. I’m writing to request that Passage’s “For Sale” listing be taken down. 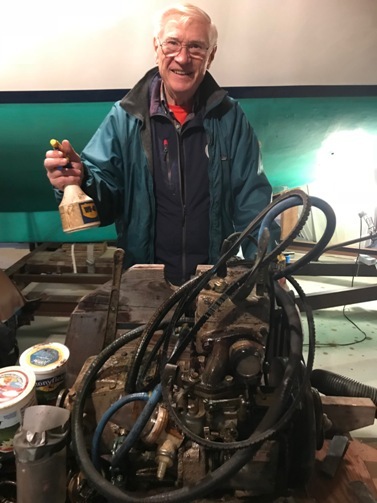 After several years of inactivity, restoration work has resumed with the goal of launching sometime in the 2019 season at a location near near New York City. 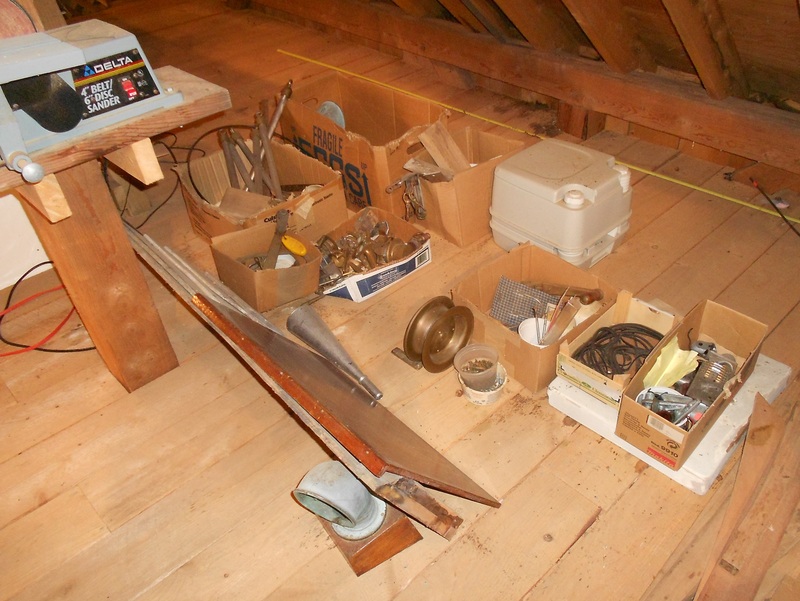 As for progress, so far it mostly involves assessing and planning the project. 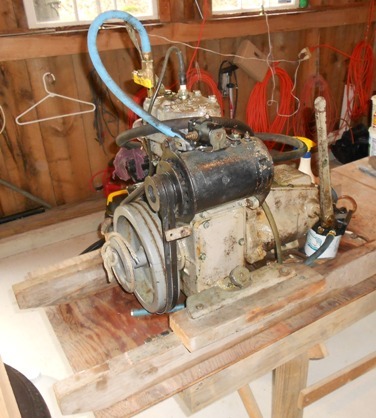 While the Palmer gas engine is probably functioning, thoughts around replacing it have consumed a great deal of time because of the trade offs of various power options. 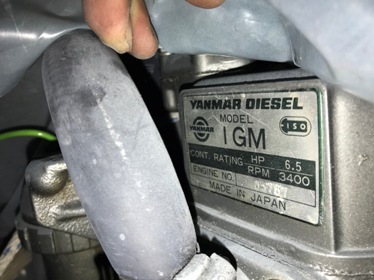 Currently I’m looking for a used Yanmar 1GM10 as the most likely best option. Other plans and choices this fall include installing a mast strut, or a reinforced main bulkhead to support the mast. 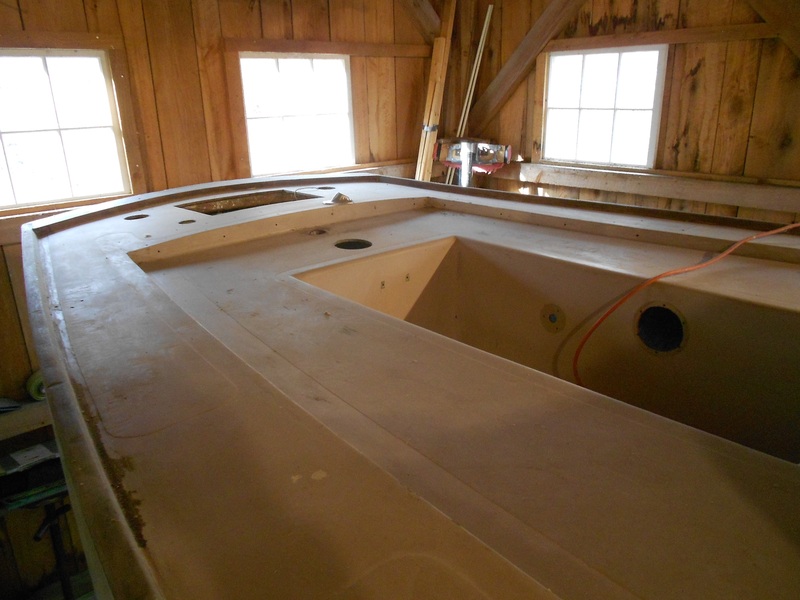 The interior is stripped out and ready for some kind of midship berths and lockers. 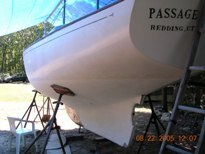 I am attaching a few photos to document the one “work day” spent with the boat. 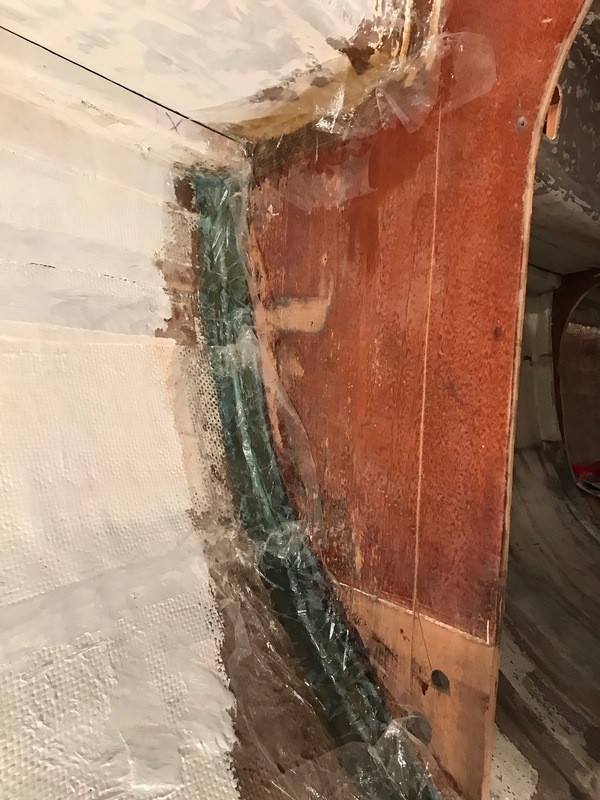 Dust and mice/squirrel droppings have been swept up and a temporary floor/ companionway stair have been set up. Significant parts re-installation/varnishing and deck/interior/bottom painting lie ahead while the weather is warm. More updates to come. Webmaster Note: We have set up a page to store the ad - it being painful to be constantly reminded - but it is part on Passage's history.....Click here to go there. Below are keeper photos and text contained in the ad that we need to keep on her main page. 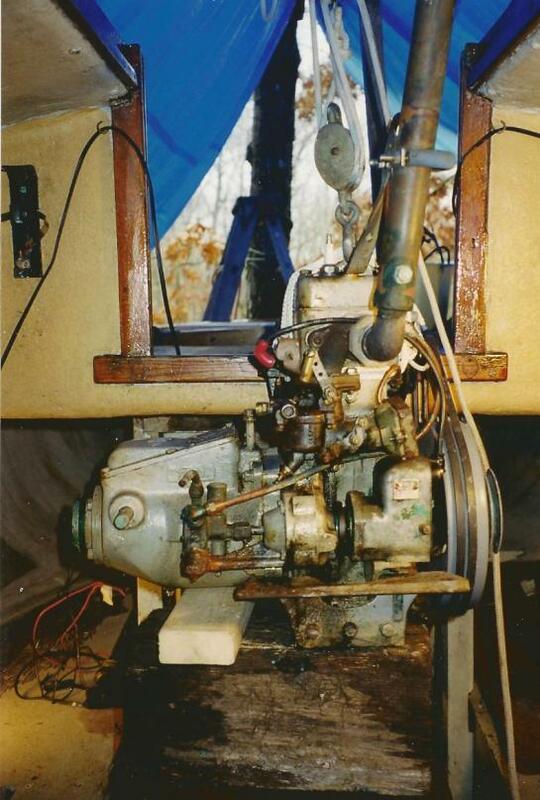 This is Passage when we found her in 1999 on the Mystic River off Noank, Connecticut. We sailed her to Niantic and hauled her there. She has not been in the water since. 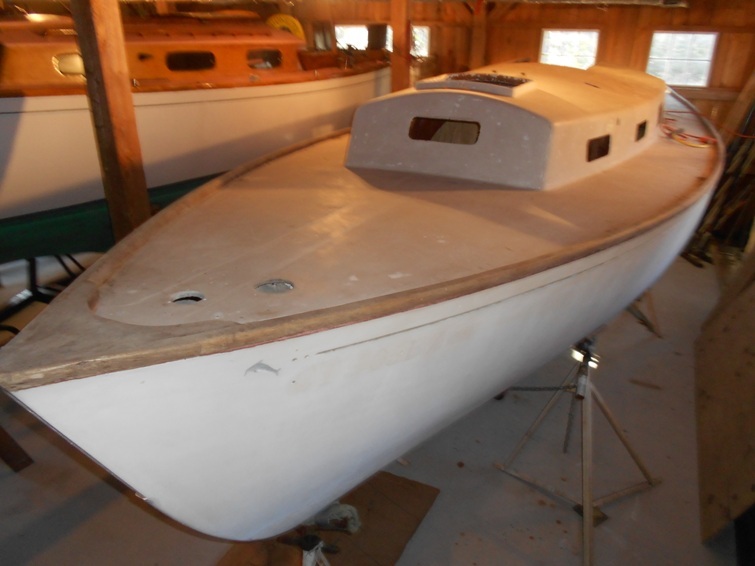 We had big restoration plans for her, but we ran out of time. 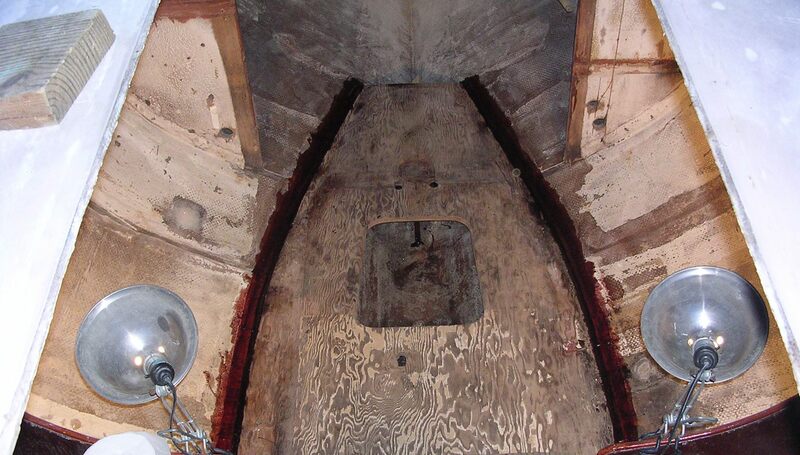 We have completely stripped her of all exterior wood, except toe rails which have been filled and sanded. 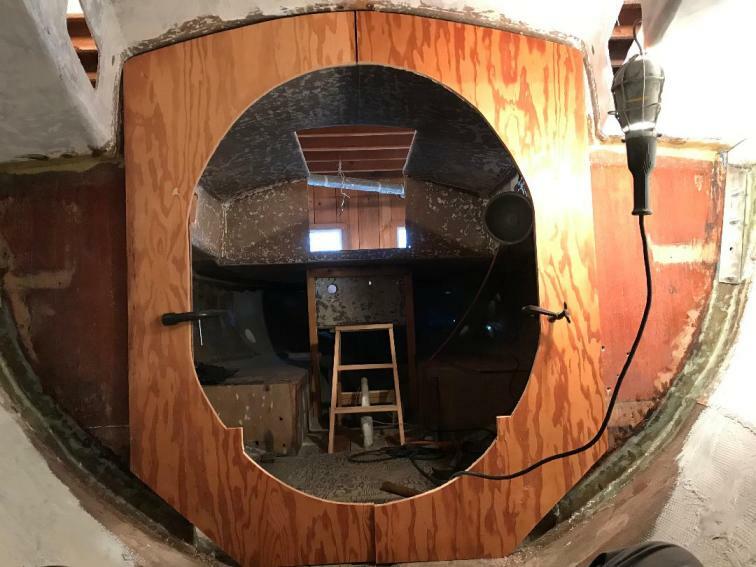 We removed all hardware, wood trim and portlights, and gutted the interior. 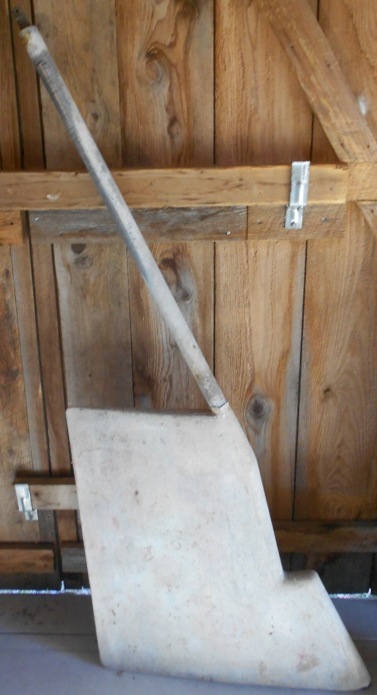 Below is what she looks like in the barn. Click on most of the photos for larger images - click the return arrow on your browser to get back here. 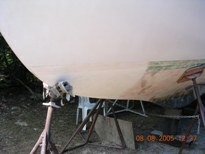 There's more detail on the work we did on her hull further down on the page. 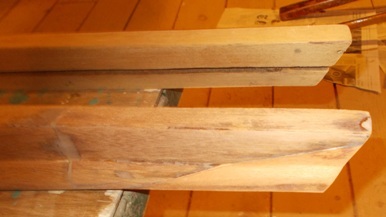 The bottom is sanded and faired, and ready for barrier coating - which we have (maybe the 'use by date' has passed?). The topsides look pretty good as you can see. The deck, house and cockpit are nearly ready for painting. 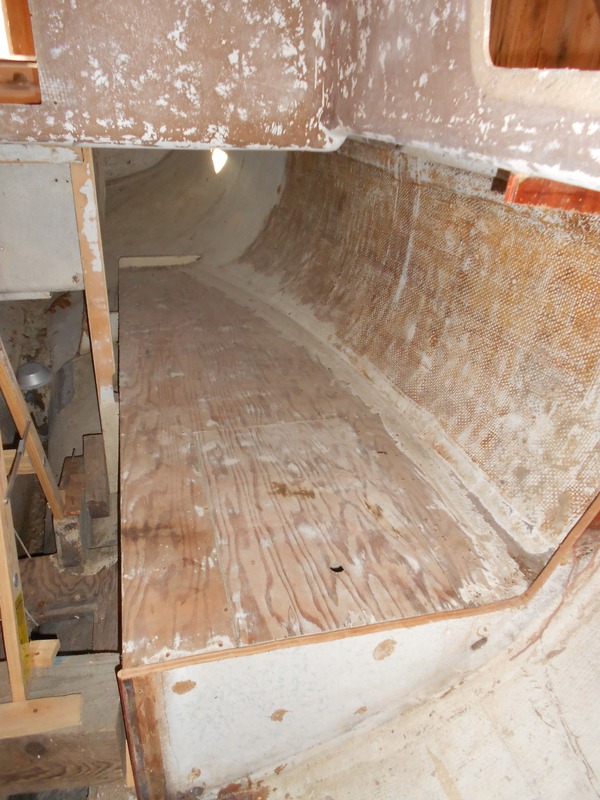 Down below Passage has been largely gutted - except for her quarterberths, engine bed and main bulkhead. 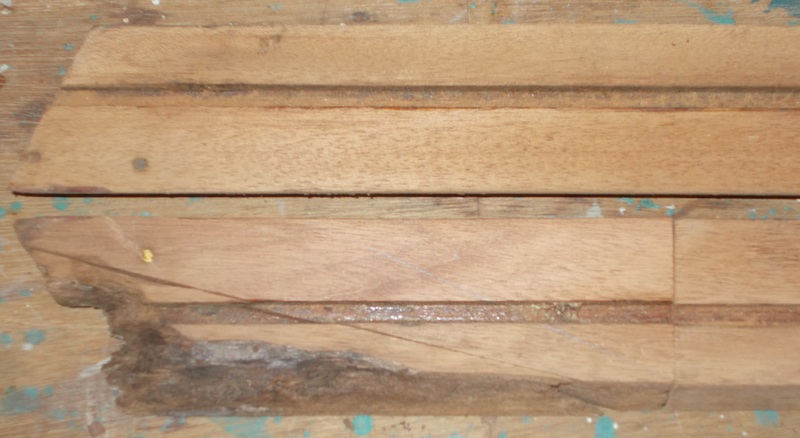 This was done to remove weak, rotted wood, and in preperation for a revised layout. The forward cabin (left) is stripped and rough sanded and the wood sole repaired, fiberglass tabbed, and faired. This was done back into the main cabin. The picture at left shows a wood mock up of a holding tank similar to the one we put in Marionette. 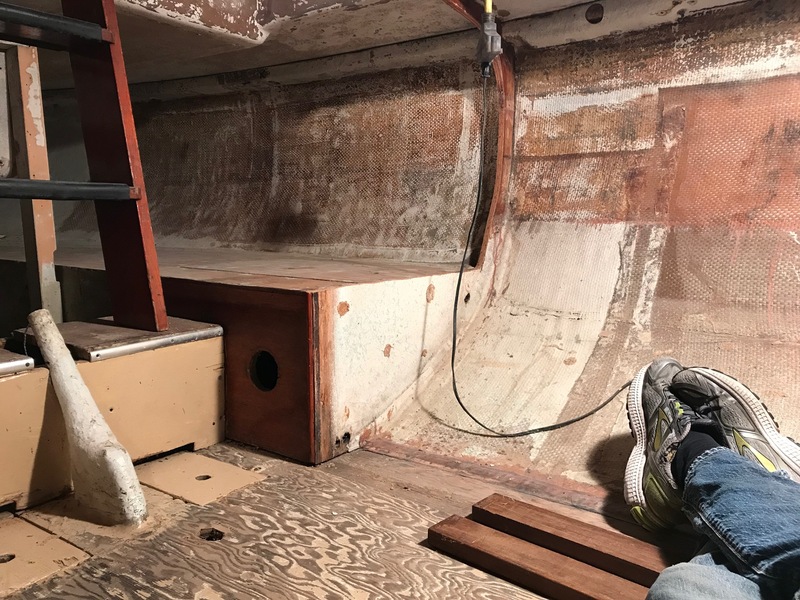 Passage had a corroded aluminum tube mast step which we planned to replace with a Purple Heart wood base and strut incorporated into a reinforced bulkhead. 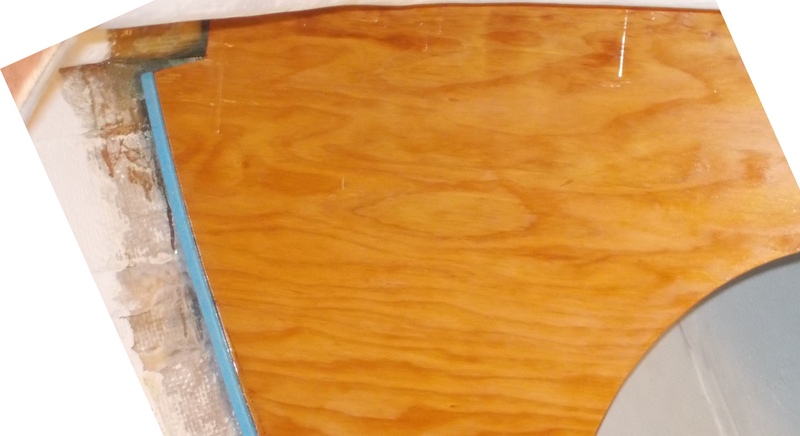 The base step below the sole has been reinforced and reglassed. This subject is covered in some detail in a related Technical Section article that you can see by clicking here. 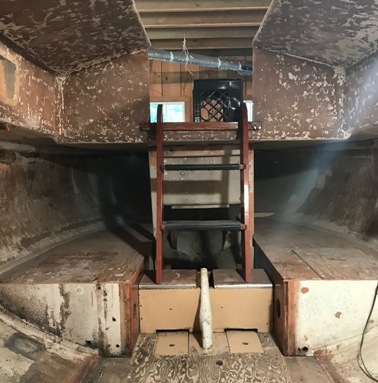 The main cabin redesign plan was to get rid of the portapotty and install a normal head in the forward cabin, along with a stowaway galley/sink. The main cabin would have settee seats/berths port and starboard hopefully making the boat more suitable for day sailing, but still ok for overnight cruising. The following pictures show the current state along with mock ups. Wood for much of this has been purchased. Variations included a siding door, and a folding door. Some of these options are shown further down on this page. The following pictures deal with Passage's 'parts'. 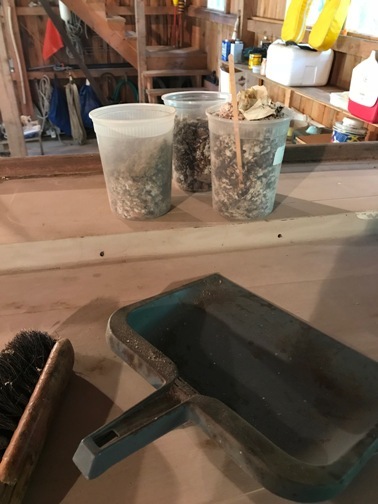 They are scattered helter skelter around the barn waiting their turn....We also have log books, manuals, drawings and literature accumulated to support this project. Remember, clicking on the photos will (usually) bring up a larger image. The original Palmer 27 at left is another WD40 soaked part, normally covered (above), and periodically turned over with her pull cord on the fly wheel to keep the inside parts covered in oil. 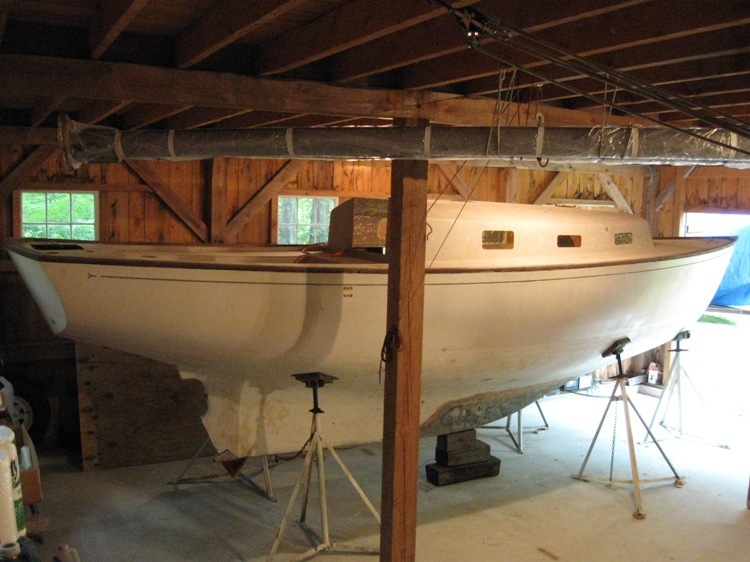 When we pulled her in 2000 we had her completely overhauled - click here to get the detail. She has been on this bench inside the barn ever since. 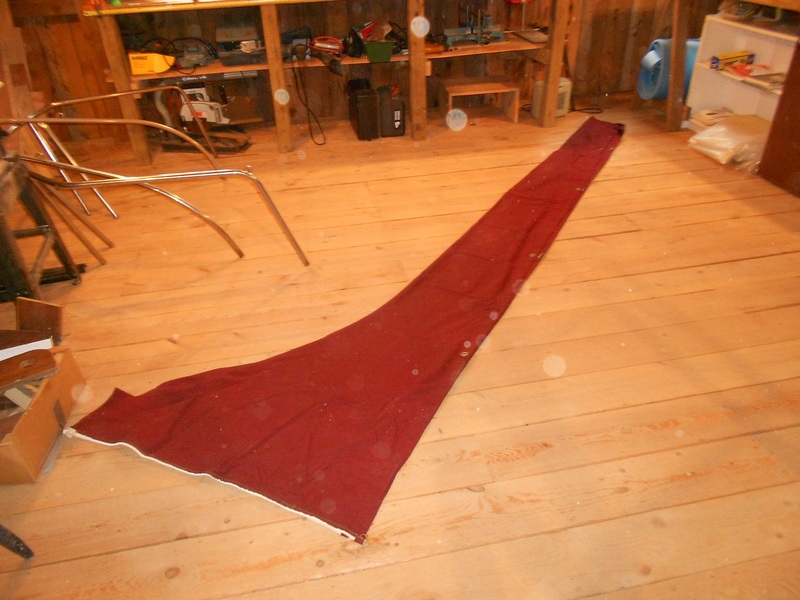 For the purists - the original wood boom and spinnaker pole - in excellent condition. Plus an aluminum boom with all fittings than can be cut to the proper length. 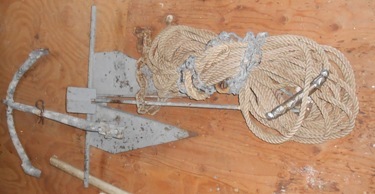 Above left are the combings and tiller. 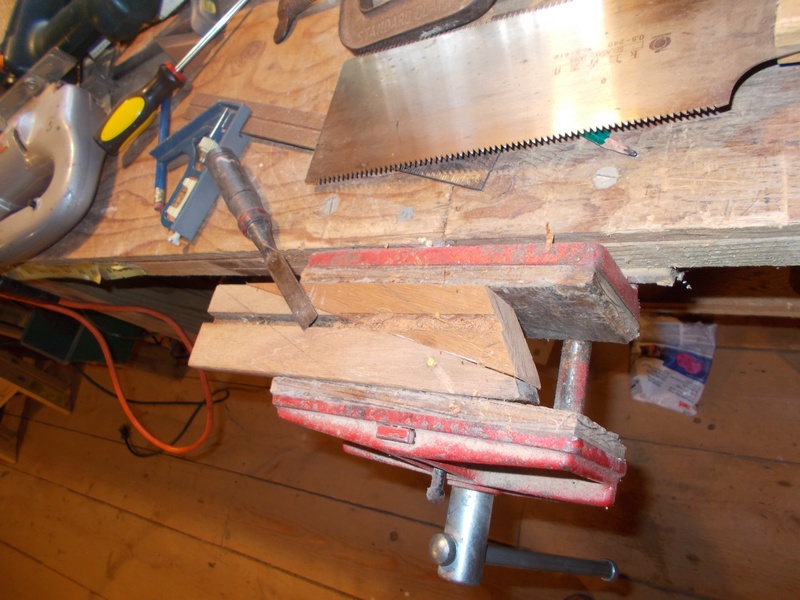 The 'shoulder' of the starboard combing had to be completely remade - an interesting wood shop project. 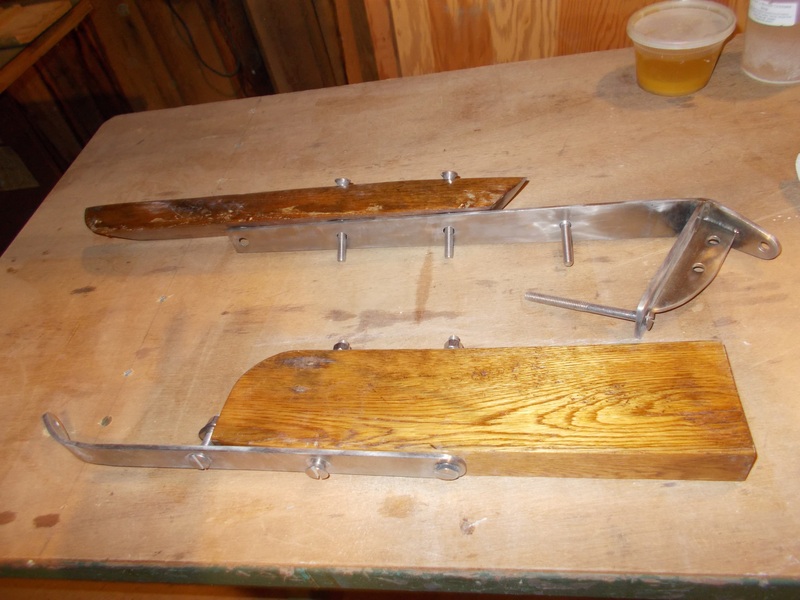 The tiller is ready for varnishing. The fitting has a nice polished look. 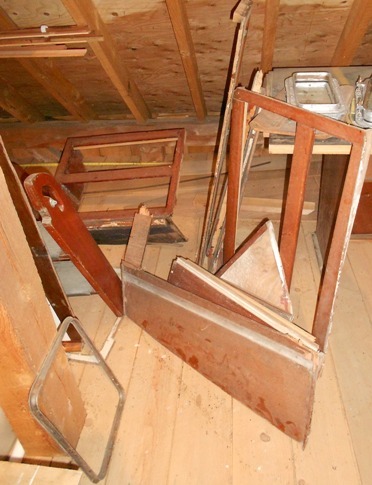 Above right are miscellaneous wood parts and frames. Above - The main hatch - wood trim removed. 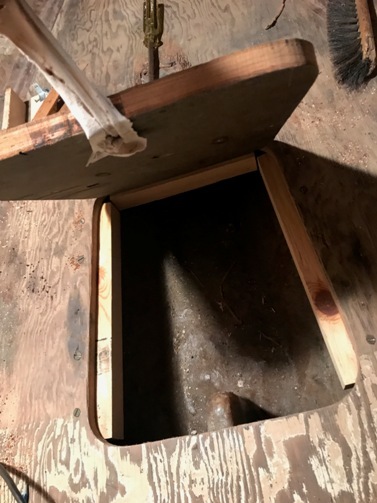 Might be nice to have a wood hatch? 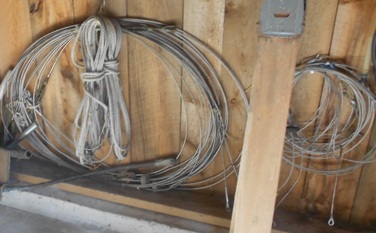 Miscellaneous parts - portapotty, stanchions, a beautiful centerboard winch, running lights, Dorade box and cowl, etc. 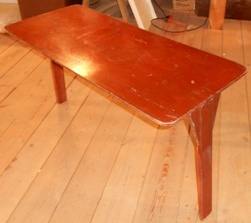 This 'portable' table has fold up legs and mounts on a center post in the main cabin - Maybe could be used in the cockpit? The thick plastic lenses need to be replaced - unbreakable glass? 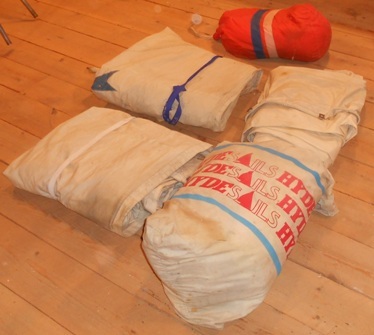 Left - Sails - Main, 4 jibs (2 in bag) and a spinnaker. Need a good washing. Probably ok to get started but a restored Passage will probably want a new dress. 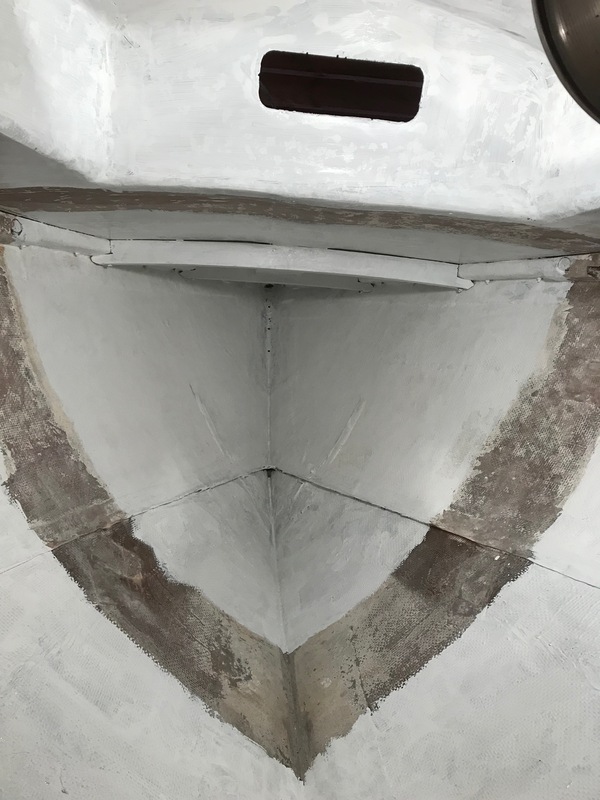 It is held together with snaps and there are 2 removable aluminum tubes athwartships fore and aft, with eyes protruding that tie off the lines to stanchions. 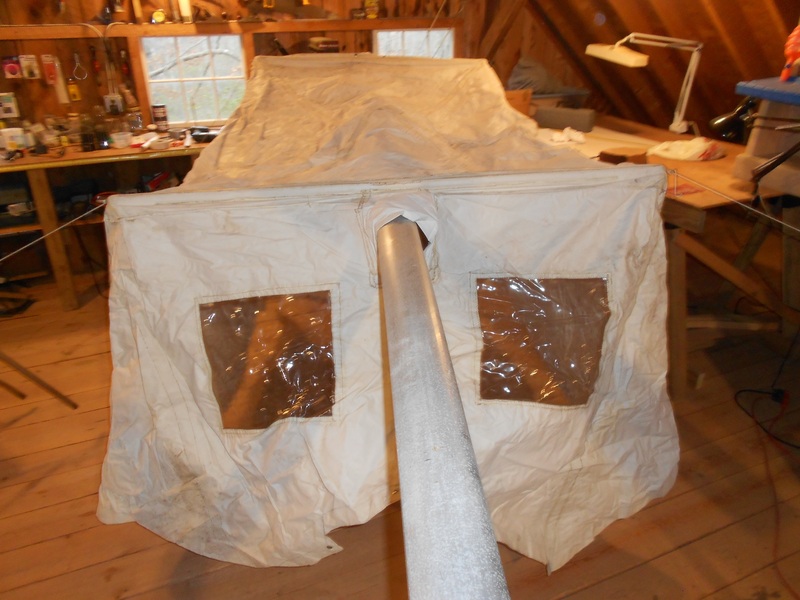 It was set up in the barn wood shop over the aluminun boom and, with a bit of imagination, you can see the forward panel stretched out around the mast, not the boom (sorry, could not set this up) and, tapering down, reaching forward to the top of the house. 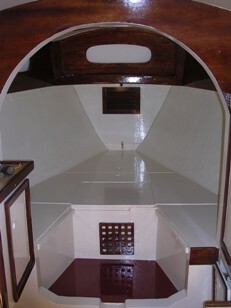 There are 2 large windows port and starboard, and a door on the starboard side. It has a eye at the center top for a halyard. November 19, 2018. Many of the above restoration comments are preliminary. 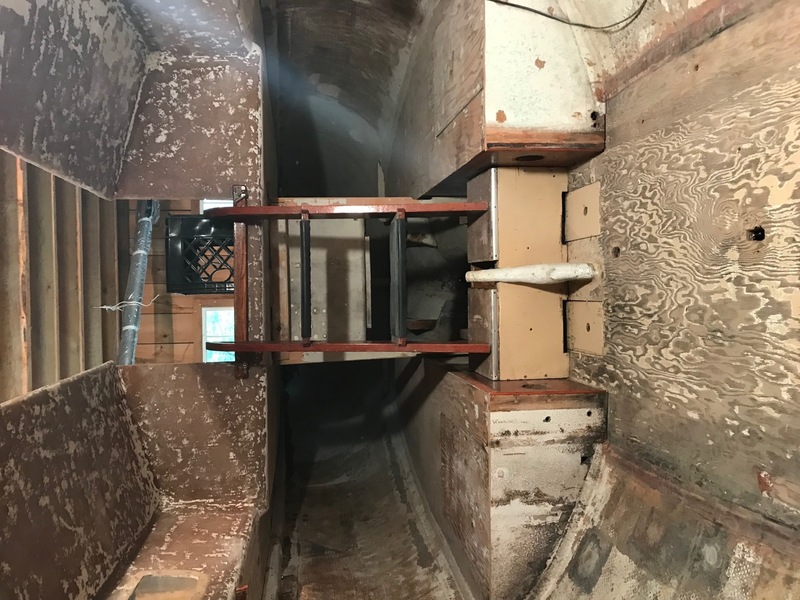 The 'master plan' continues to evolve - in the meantime work continues primarily on cleaning up wood parts, grinding and sanding down below, undercoating the interior hull surfaces, and sanding and prepping wood parts for the the multiple varnish coats. "Teaser" photos below. Mike has prepared a detailed work plan that gets modified as time goes on. 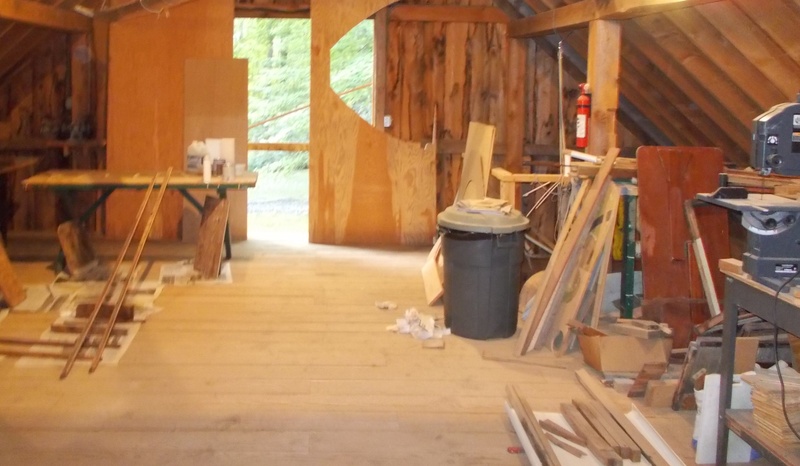 He is coming up from New York city to the Passage/Marionette barn in Old Lyme. 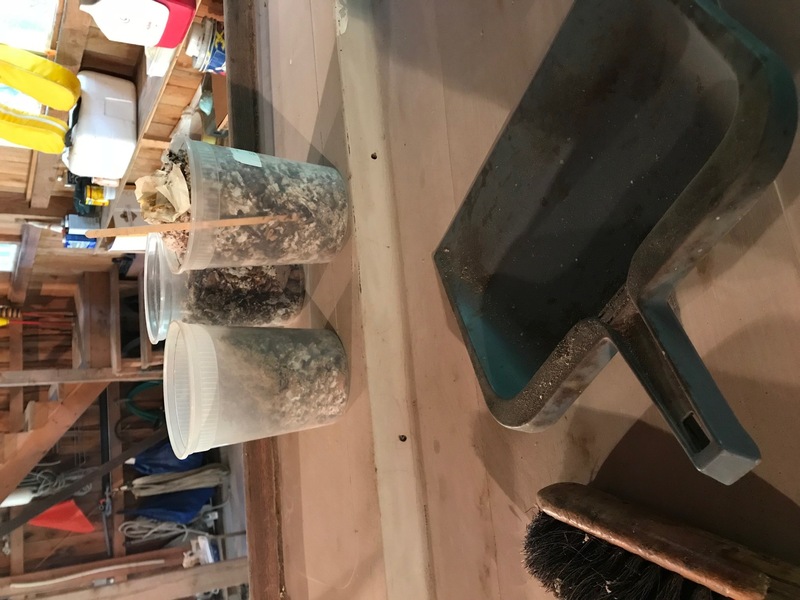 Below is a catch up summary of his work since September 22, 2018 to date. 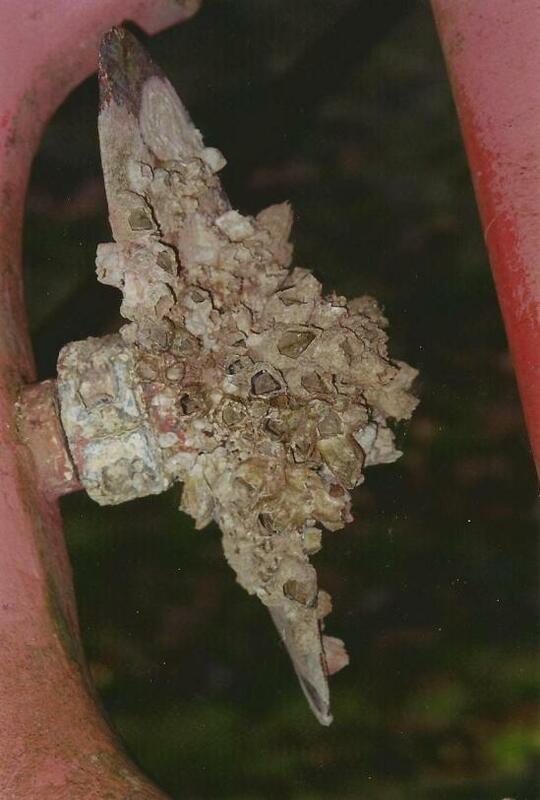 > Over the past 2-3 weeks the Git Rot test area appeared to have hardened, so drilled 60 holes in rail at one-foot intervals and more around stanchions, then filled with multiple batches of Git Rot. > Continued to experiment with ways to prop up the companionway ladder. November 21, 2018 Senior DFI Mark Steinhilber sent in some comments on the above - They are included in the Technical Section and you can get to them by clicking the comments in Whats New November 20 - click here to go there. 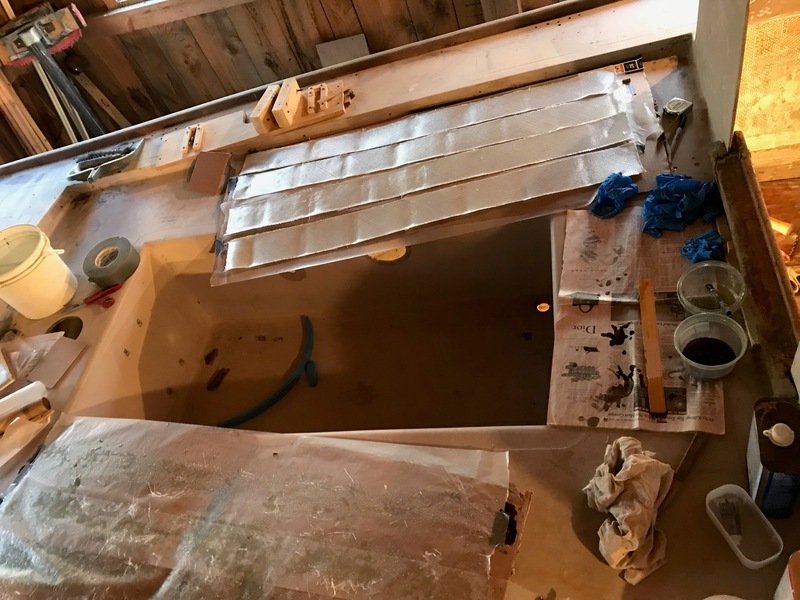 We have a few project photos and comments to be added to the project file. 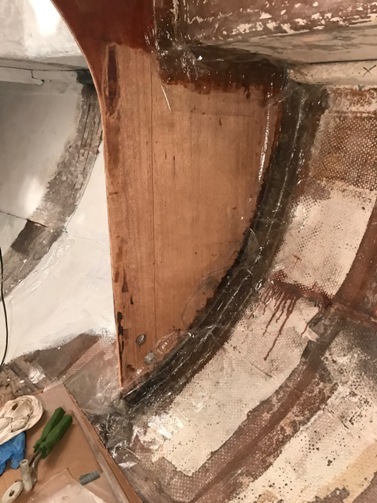 This 'completes' the initial Passage Restoration restart report. > Work continues on sanding and applying multiple coats of varnish for small wood parts. 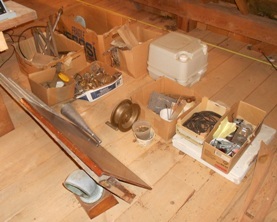 Photo Right - Miscellaneous wood parts including the tiller. Photo Below - forestay and backstay assemblies, polished endplates, new bolts and nuts, and varnished backplates. Trim and sand new main bulkhead tabs to prepare for surface finishing, haven’t decided on painting versus using thin wood veneer with varnish. 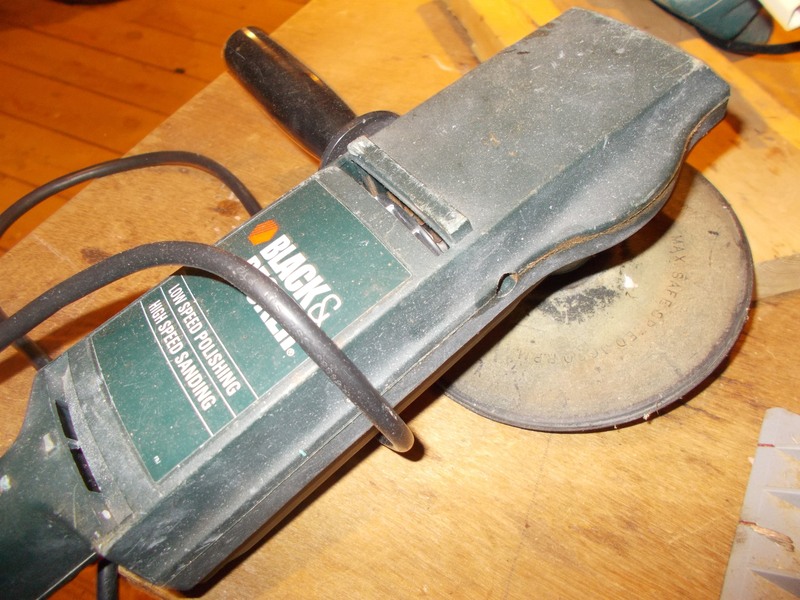 Re-cut and re-drill the shroud chain plate slots and bolt holes, order and test-install chain plates with bolts. 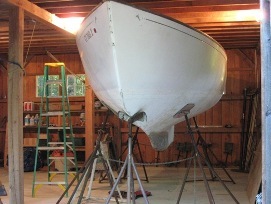 Steel brush/sand bow area to prepare for second coat of primer. Additional design experiments for companionway ladder. Continue to fill holes in deck from Git Rot application and at bow bulkhead. I hope the update above, along with photos, is interesting. At least it shows some progress! This is the first dry fit of a new 3/4” plywood layer added to the aft face of the main bulkhead. Together with a layer added to the forward face the total bulkhead thickness will be 2 1/4”. It was initially a single piece but that did not fit through the hatch. 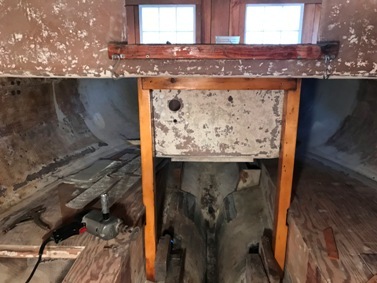 Small wood wedges along the floor press the bulkhead upwards and close the gap to the cabin roof; these will be made strong with plastic furniture wedges and the bulkhead will be fiberglass tabbed into place. The existing bulkhead has fiberglass tabs fore and aft, all the way around. 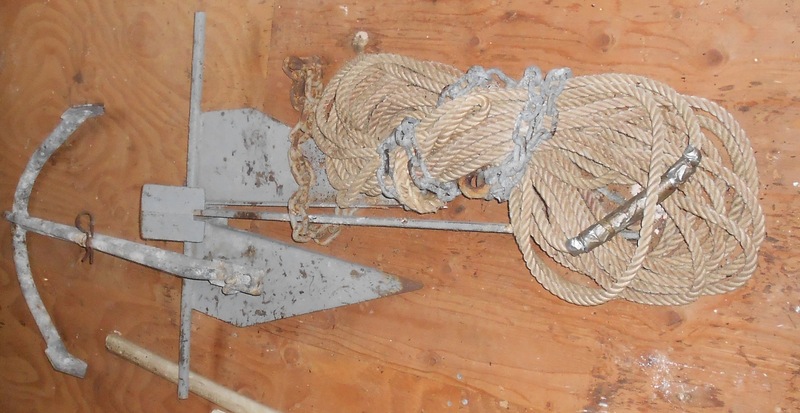 Along the roof, the upper tab forms an “L” bracket that provides much of the strength needed to hold up the mast. Two new tabs (L brackets) will be added for a total of four. 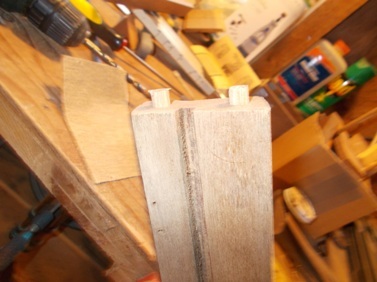 The small point either side of the cutout are the end points for the port and starboard settee. The step over is about six inches. Space forward of the bulkhead is for storing sails. This was the start of the original Passage's website page. 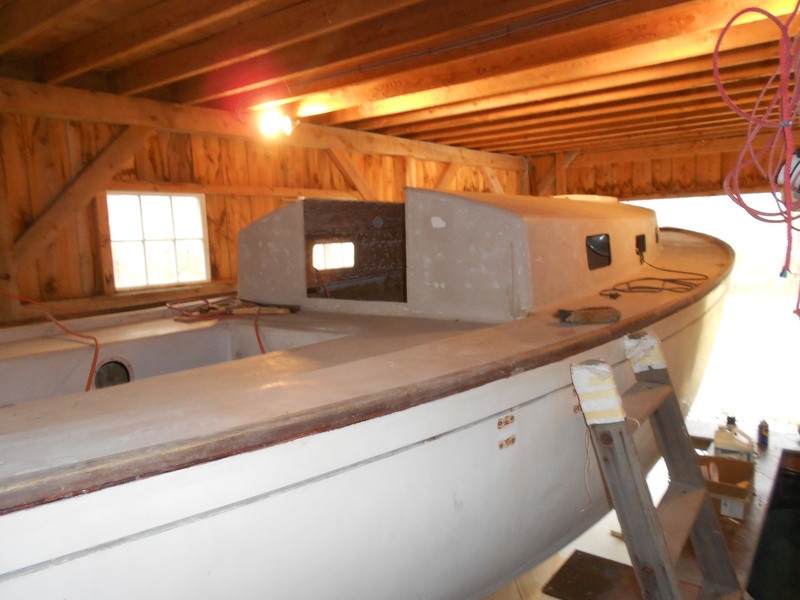 Mike bought this boat in September, 1999 and she was moved to this location - the initial Dolphin worksite... Marionette was restored in 1995/1996 in exactly this location - before we built her a barn. 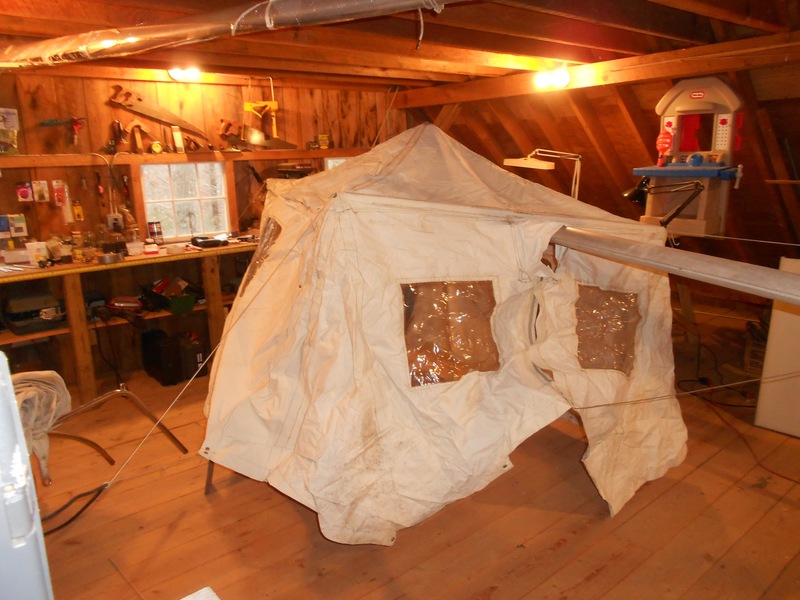 Webmaster note: In early September, 2008, in an effort to get the project rolling again, Passage was moved into the Barn using the No-Travel-Lift-Do-it-yourself-system. See below. The following are two pictures of Passage as we found her on her mooring on the Mystic River in eastern Connecticut. 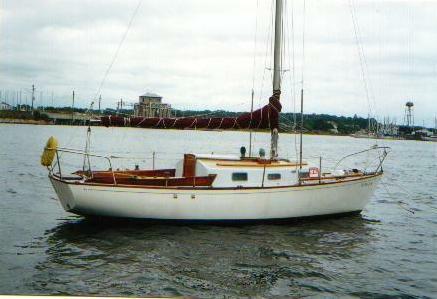 Mike bought her from Gene Connolly of Redding, CT in September, 1999. 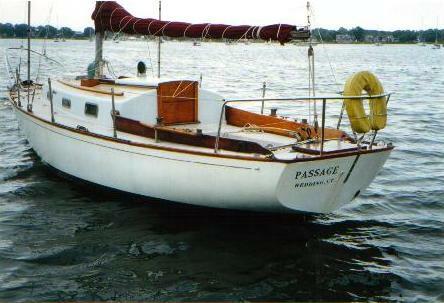 Gene bought her from Don Gardner of Bellport, NY in November, 1977 and changed her name from Menehune to Passage. 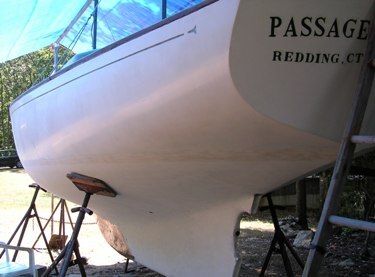 Don Gardner bought this boat from Ralph Seidenspinner in 1968 and he believes Ralph is her first owner. There is a Jack? Atherton from West Islip, New York in Passage's old files suggesting he might be the first owner, buying her in June, 1960. Stay tuned on this. 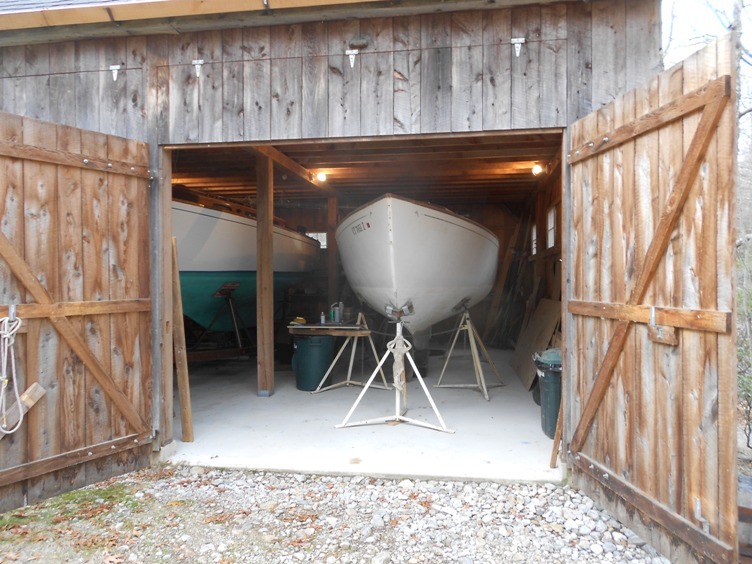 Your webmaster and Gene Connolly sailed her from the Mystic River to the Niantic Marina. 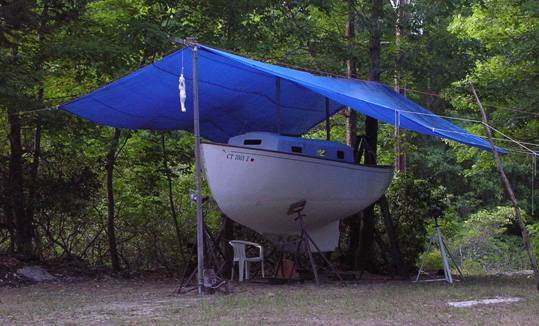 There, in a slip, Gene showed me how to lower a Dolphin mast using the spinnaker pole as a gin pole and a couple of side struts. We (he) did it. Ever since, I have had a healthy respect for this manuever, and anyone who can do it successfully. 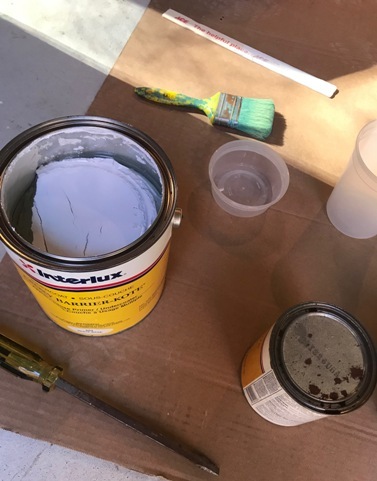 There have been a lot of fits and starts on this project. As of March, 2008 this is an overview of the status. 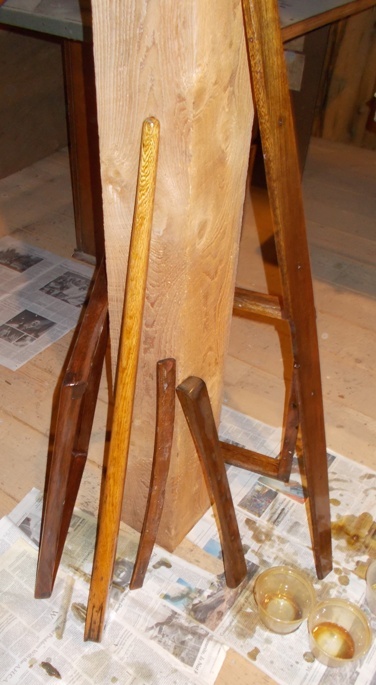 The toerail track has been removed, toe rail has been sanded, filled, and varnished - a few finish coats of varnish remain. 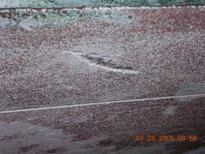 The following pictures give some idea of what we were dealing with. All these have been repaired, reglassed in some areas, epoxy filled, the bottom faired, and the first series of barriers coats applied. 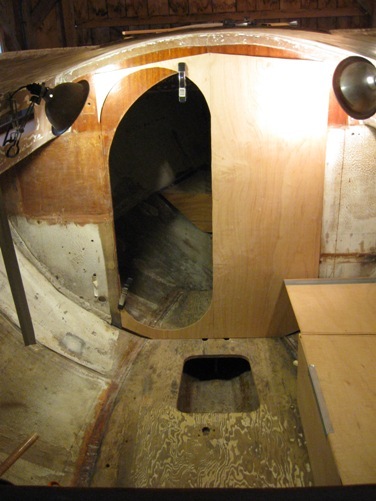 A few areas remain to be dealt with, ie., the centerboard holes and through hull fittings. 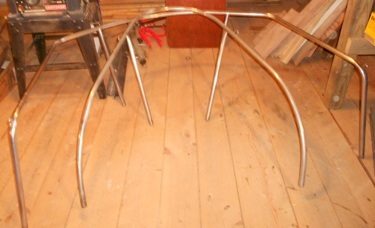 The bottom will be resanded and barrier coated again. That large blister at the left was pretty scary. All these blisters, gouges and scratches have been filled and resanded. Look closely at the bootstripe. It sits on top of the old scribed boot lines. We never weighed the boat but it certainly was heavy. 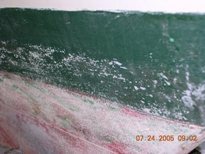 The hull sat drying out for almost 3 years before we tackled this job. It will be interesting to see where she floats when we are done with her. 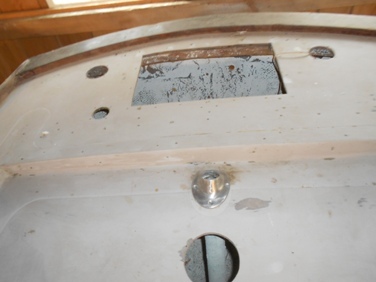 The bronze centerboard has been removed and the 'stop' cut off. This will allow the board to go further forward and a bit deeper. The CB had a lot of pitting and scaling most of which has been removed - this yields a lighter and thinner board - the opposite of what we want. We are 'thinking' on this. We also want to be able to remove the CB annually and are looking for a sane way to do this. The rudder and rudder stock (click here to see rudder and stock) have been removed and the prop shaft removed. The rudder stock heel fitting was badly corroded. This rather critical part was not available in the local marine supplies store so a new fitting was designed and built - this the subject of another article coming soon to the Technical Section. 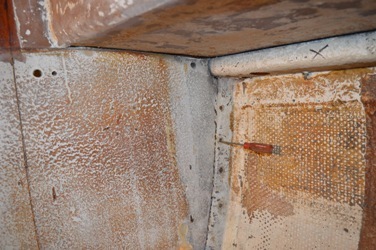 This picture shows the finished fitting in place. It still has to be filled and faired. 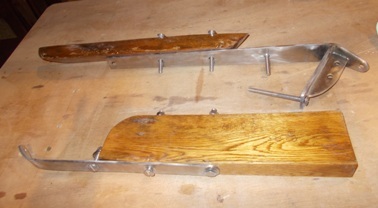 Click Here to go to new rudder post heel fitting article. 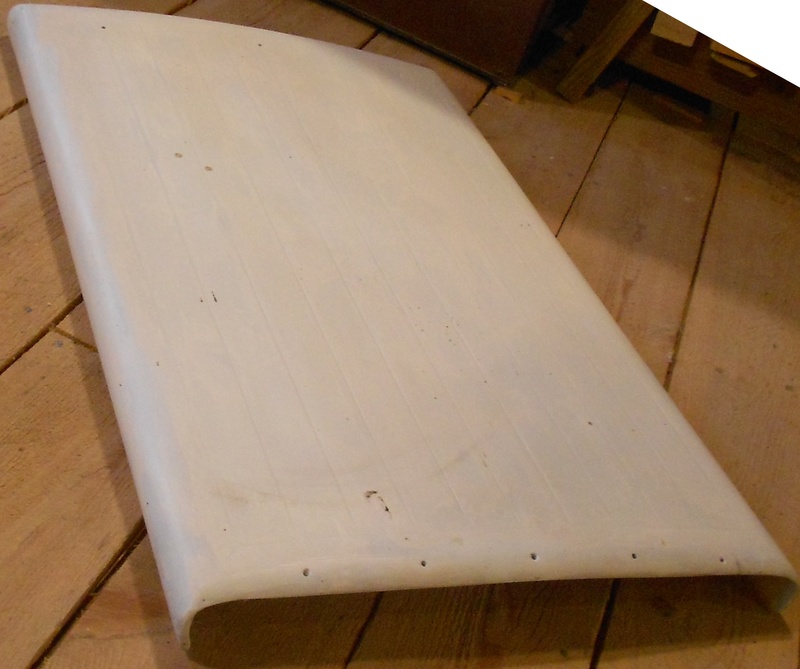 Passage had her name plate in the center of the inside edge of the aft facing wood trim piece at the leading edge of the main hatch. The following photo, discovered in a 'purge files" effort, was determined to be a keeper. 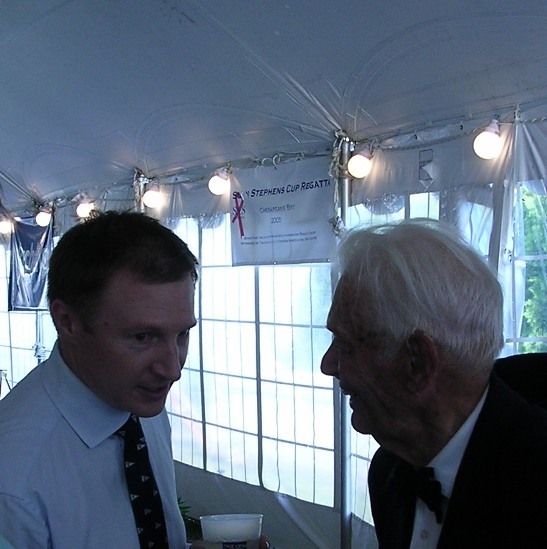 It was taken at the S&S 75th Anniversay celebration dinner at Mystic Seaport, July 10, 2004. Mike is certainly discussing the finer points of Dolphin design with Olin Stephens. For more about this very special event click here. 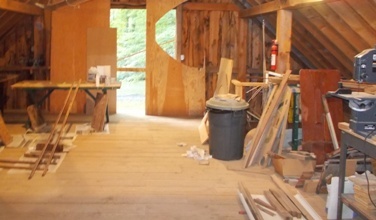 OK, back to work - Passage gets moved from under the tree into the barn in mid September, 08. We'll skip the steps of taking her off her poppits, getting her on the trailer, moving her into the barn, getting her off the trailer, and back on her poppits. 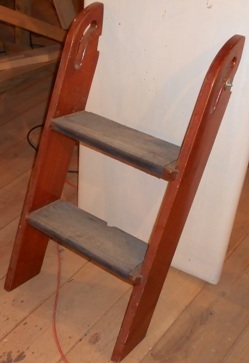 As you can see, it was done, by one person, using the afor mentioned No-Travel-Lift-Do-it-yourself-system. It took a while, much of it looking and checking and rechecking to be sure nothing went wrong. December 17, 2009. Cleaning up the back corner of the desk I came across a couple of old pictures and decided it was time for an update. The temperature in the barn is about 20, so writing about Passage is a lot easier than working on her. First, this picture of Passage's prop when we pulled her out of the water in 1999 needs no further comment. February 20, 2010. 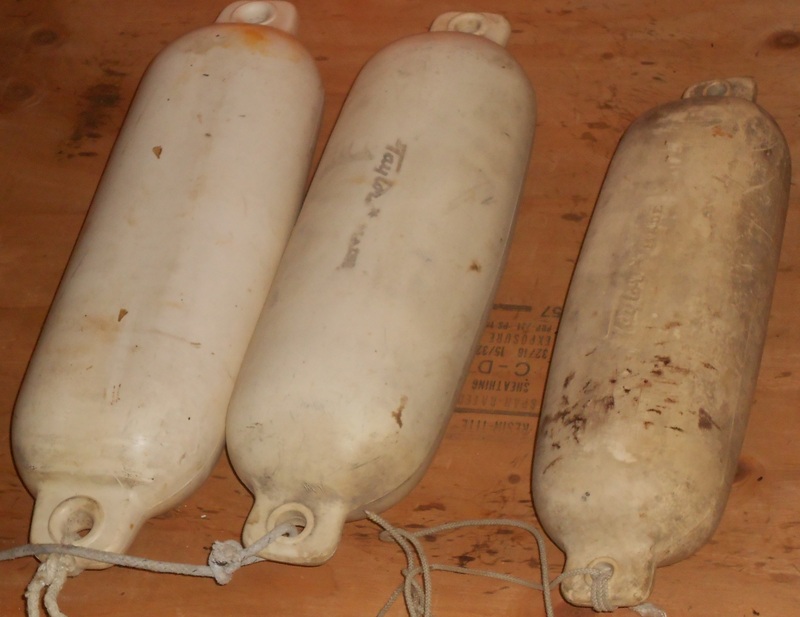 Jim Homet is restoring Tiki, O'Day #28, and posted some stuff/questions on the Forum. Click here to see that exchange. This prompted a response based on our current restoration plans for Passage, a very patient lady awaiting some additional energy directed toward her situation. 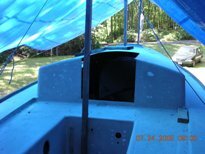 The basic concept is to have a simple daysailer setup, with reasonable comfort for cruising, and especially a private head with door. The plan is to have the v-berth disappear and become instead a forward cabin with a (hidden) head, sail storage, a sink with work space, and a small pull out/down galley with storage - some details still to be worked out. 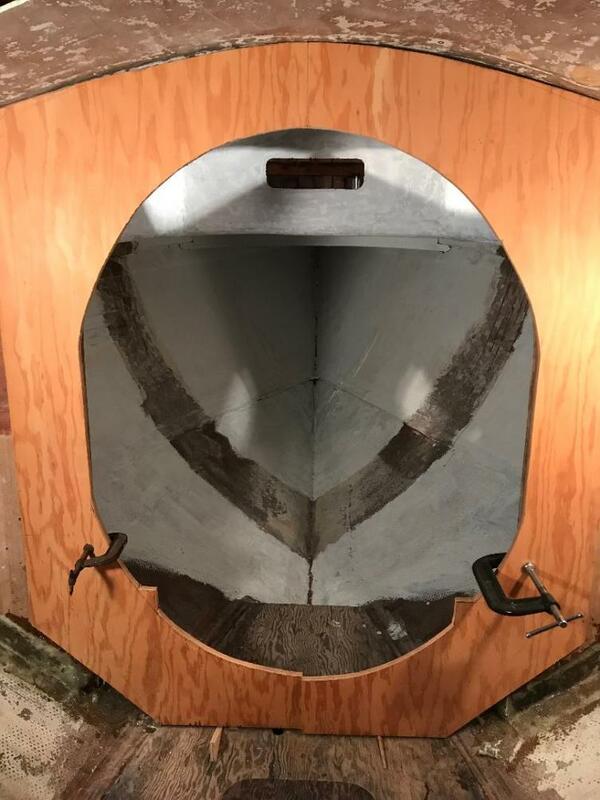 The now open bulkhead will be closed in and there will be a proper (possibly a sliding type) oval shaped door on the port side. 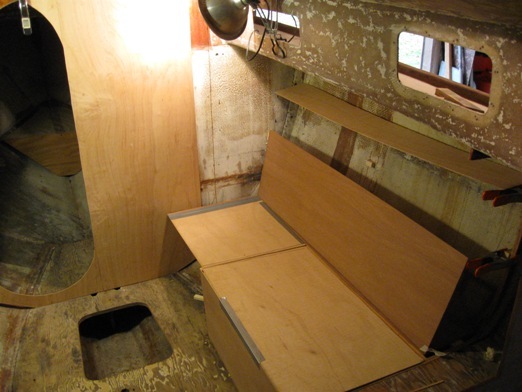 The main cabin will be two settees with a 'open bench type' slat backrest, storage behind and 2 shelves above. These settees will convert to a single/double bunk on the starboard side and a single on the port side - storage under both. 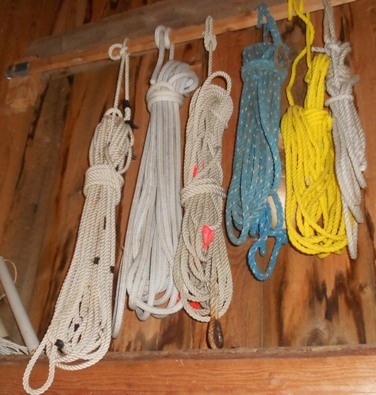 No hanging locker - a table system is still under study. The 'fridge' will be a portable cooler under the steps. 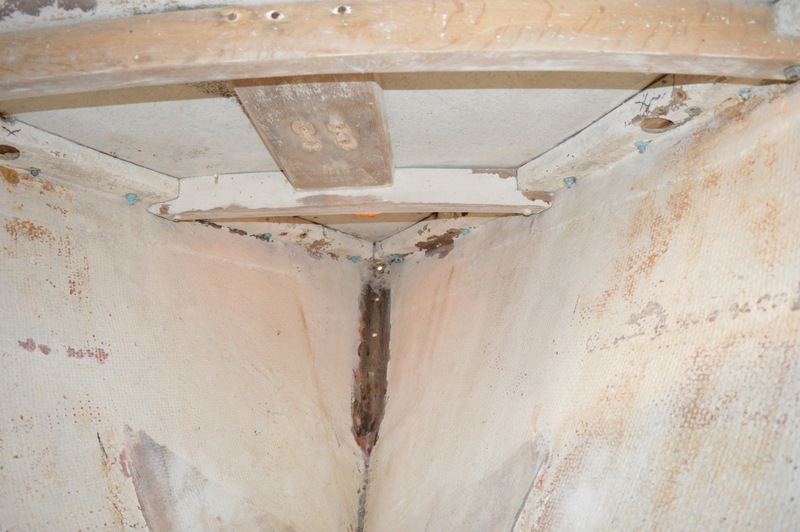 There will be no change in the quarter berths set up. 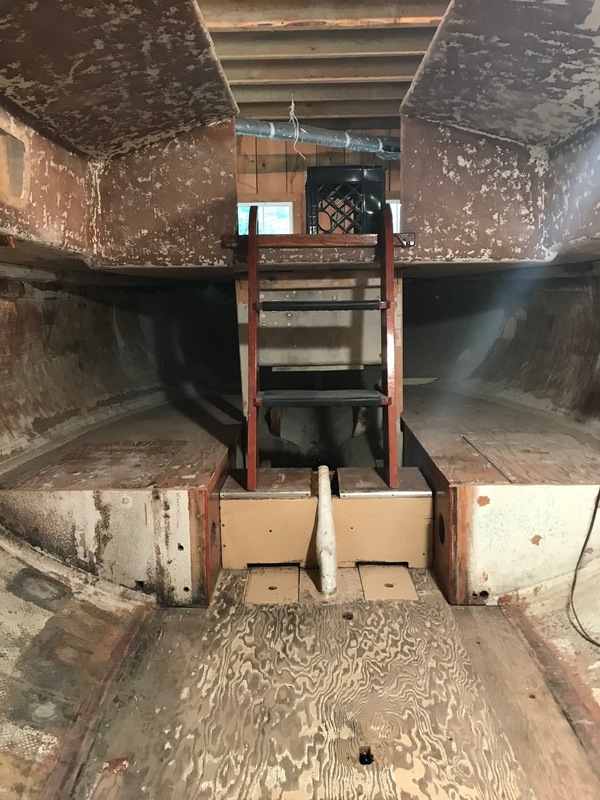 The companionway steps will be replaced with a Marionette type steps system and a set of lockers built into/below the bridgedeck. Work with me here. 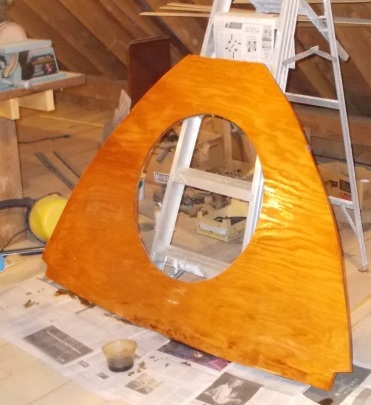 Above is a mock up of an oval door cut out of a thin plywood panel to see how it looked.. The door could be a slider (probably), or a folder. 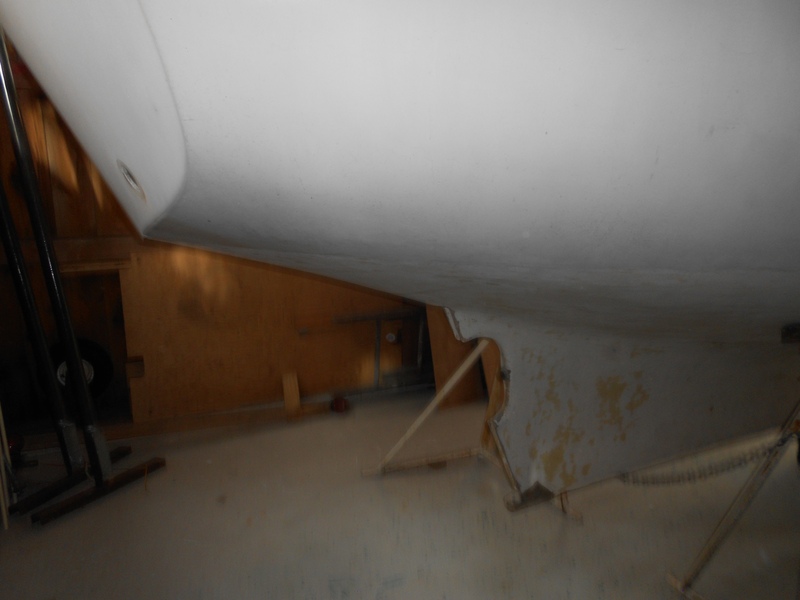 The panel would cover the full width of the boat and hide a strut under the mast step. The 'book' says this door should be 22" wide. We might squeak 20". 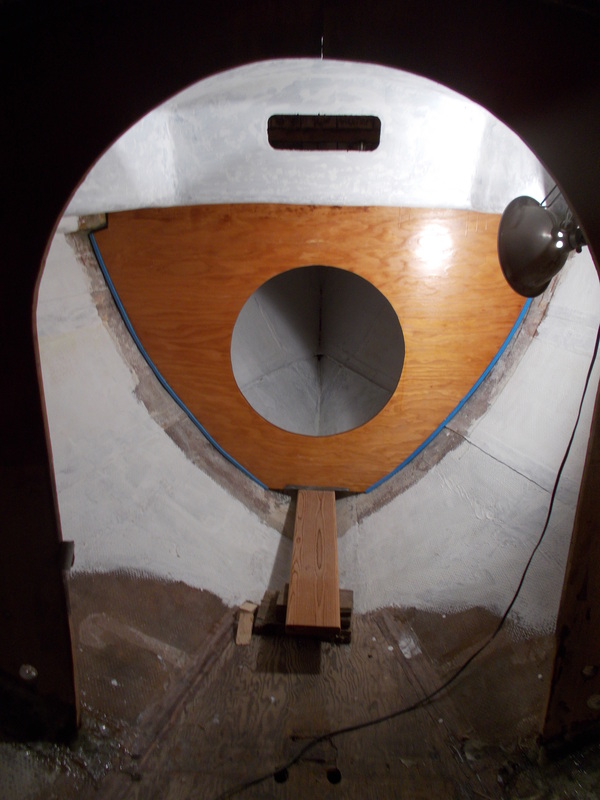 The height is ok and limited anyway by the floor and by the fiberglass flange tabbing the bulkhead. We are thinking of a face trim piece of molding hiding the flange and looking like the edge of a beam. 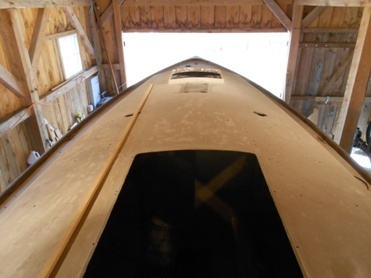 If we go with the oval door shape, when slid to the right, it duplicates the appearance of port side opening itself. Sliding doors can be problematic. Above is a sketch of a folding door concept that could more easily yield a 22" opening. 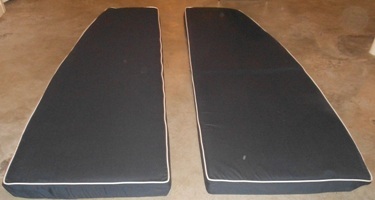 Most of the time the door would be open, folded back on itself, and a simple clasp could keep it that way. Worth thinking about - and can be easily changed if it does not work out. 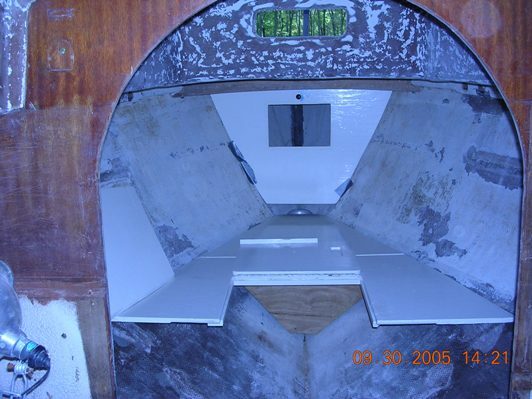 The above picture is a mock up using Marionette's v-berth panels. More design work needs to be done on the forward cabin layout. There will be a removable panel in the peak for a chain locker ala Marionette's. 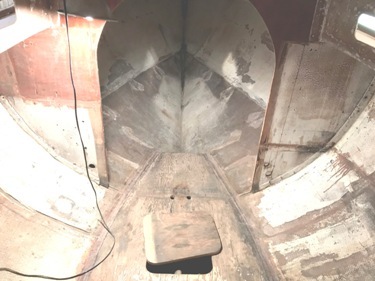 Assuming the head is centered, and it probably will be, a full width seat back is envisioned in back of the head behind which sails and other stuff can be stored. 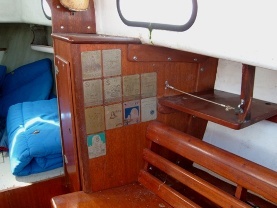 We think we can also work in a convertible bunk up here for a crew, or a kid. The sink and counter space will face forward on the starboard side backed by the bulkhead, and tucked under the deck. Shelves and built in lockers above and below are envisioned. 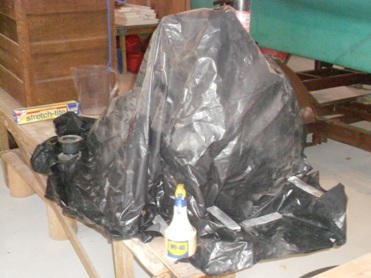 A small fresh water tank, probably flexible, will go somewhere, hopefully low. 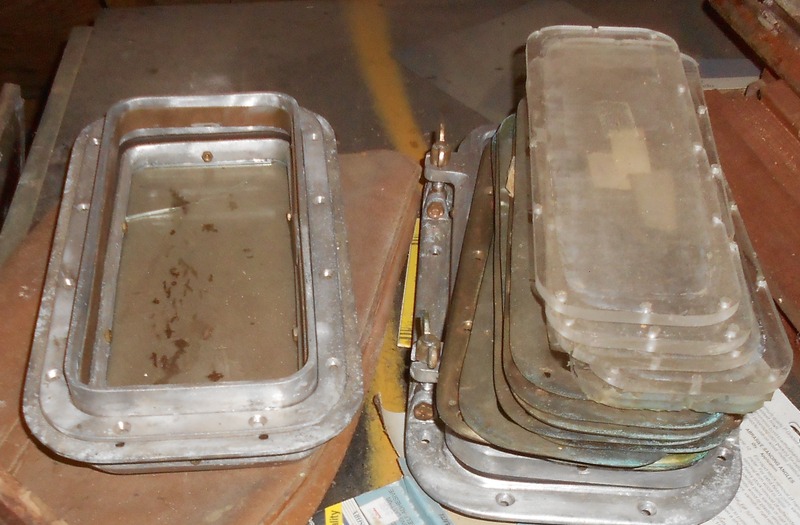 Looking at Marionette's v-berth at left gives a better idea of how much space there is between the forward side of the bulkhead, and the aft edge of the head compartment. Enough, I think, for a good sit down work area. At left is a mock up of the proposed starboard settee, storage under. 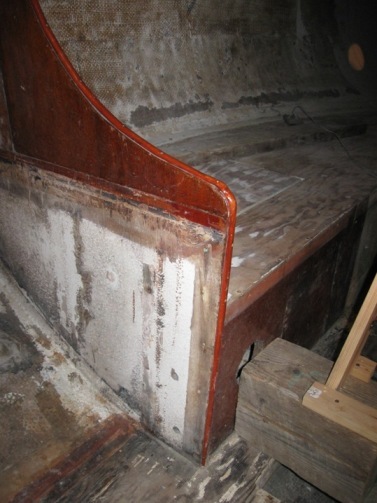 To make a spacious double the vertical face on this side will 'flip' up and the seat back will 'disappear" into the quarterberths.. Actually, we saw Don Barnett's (Casandra Rose #56) settee backs and really liked them (above). We plan to do something similar on both sides. 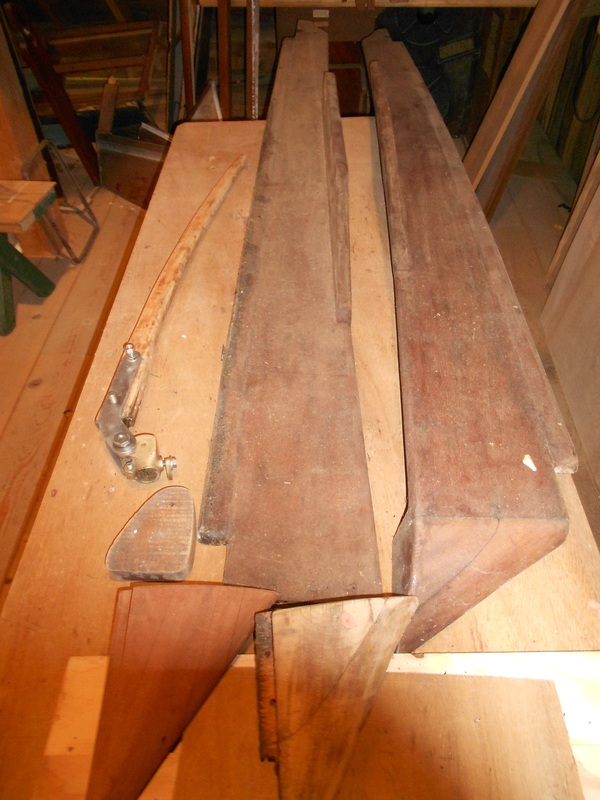 We'll have shelves with fiddles full length. No hanging locker. 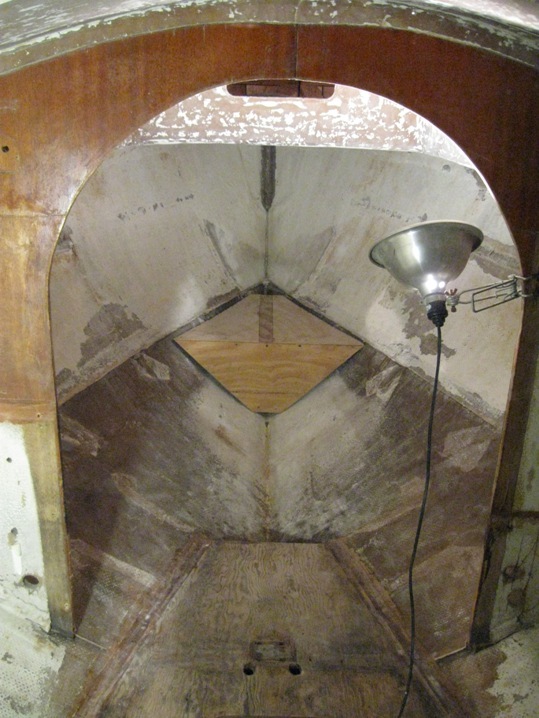 Above right are Passage's companionway steps. 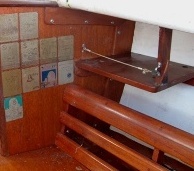 At left is Marionette's steps system with lockers under the bridgedeck and the electrical panel. 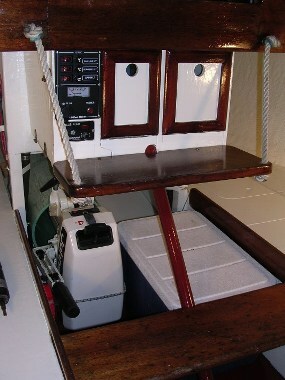 The center locker houses the centerboard winch. A side panel behind the electrical panel provides access to wiring plus storage for fuses and flashlights. 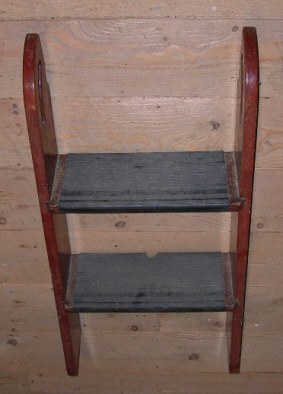 The cooler slides under the bottom step and the steps are removable. We are planning to do the same on Passage. You can see more on this system by clicking here.